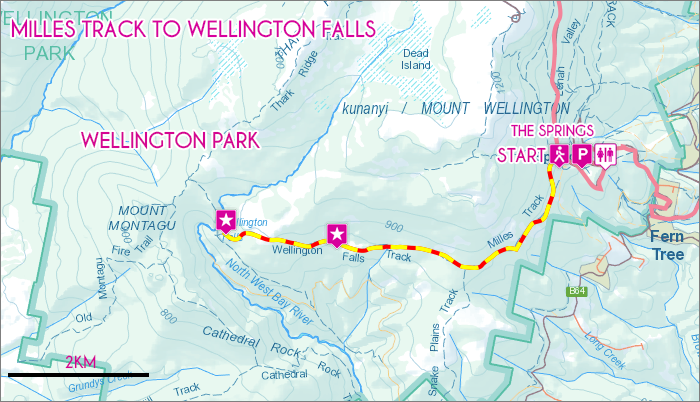 The Milles Track to Wellington Falls is a 12km, medium difficulty walk following the southern contours of kunanyi / Mount Wellington. 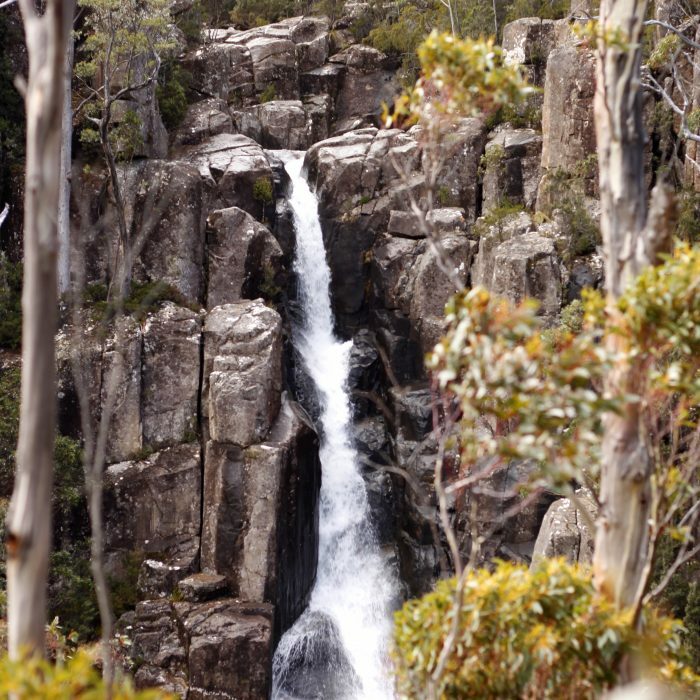 This trail presents multiple views of the greater Derwent River area, occasional glances of the breathtaking Disappearing Tarn and ever impressive views from the top of kunanyi’s highest waterfall, Wellington Falls. View Google Map Directions From Hobart head west via Davey Street (A6). Keep in the right lane and continue past the turnoff to the southern outlet. After 6km, turn right onto Pinnacle Road (C616). The Milles Track starts 3.5km along this road at the upper section of the Springs car park. 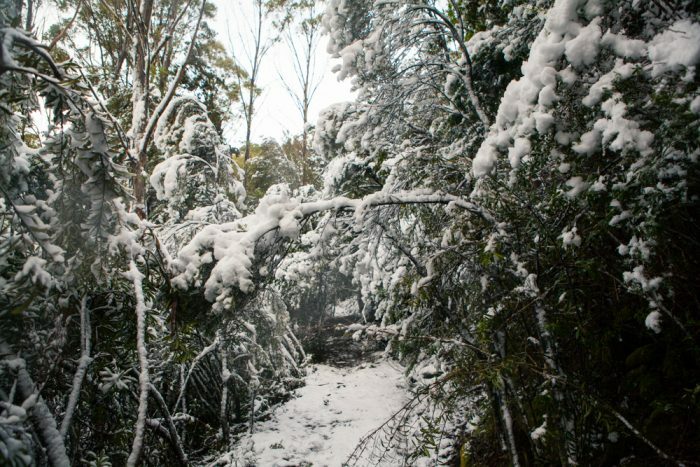 The Milles Track begins from the upper section of The Springs carpark. After a brief 100m climb up the stone steps the track splits in two; with the left-hand fork signalling the Milles Track trailhead. Continuing left, the track slowly and steadily climbs, passing the Ice House Track to the right a few moments in. Staying on the left, the trail follows the contour of kunanyi’s southern face occasionally opening up to beautiful vistas of Hobart, the Derwent River and the D’Entrecasteaux Channel beyond. Overgrown with a mix of sclerophyll vegetation, the track is rough in sections as you continue to gently climb higher up the mountain’s face. Once the highest point has been achieved, the trail descends towards the Disappearing Tarn and the Potato Fields. On most occasions, the Disappearing Tarn will be empty and will go unnoticed as you walk by. 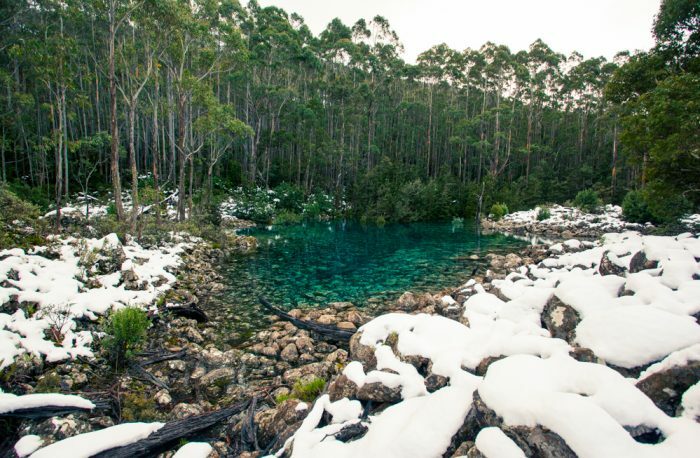 However, after multiple days of consistent rain in winter months, the tarn may present you with breathtaking turquoise waters, beautifully juxtaposed in colour to the surrounding landscape. The trail continues across the Potato Fields, a long section of boulders which can be difficult to navigate in poor weather. Care must be taken. 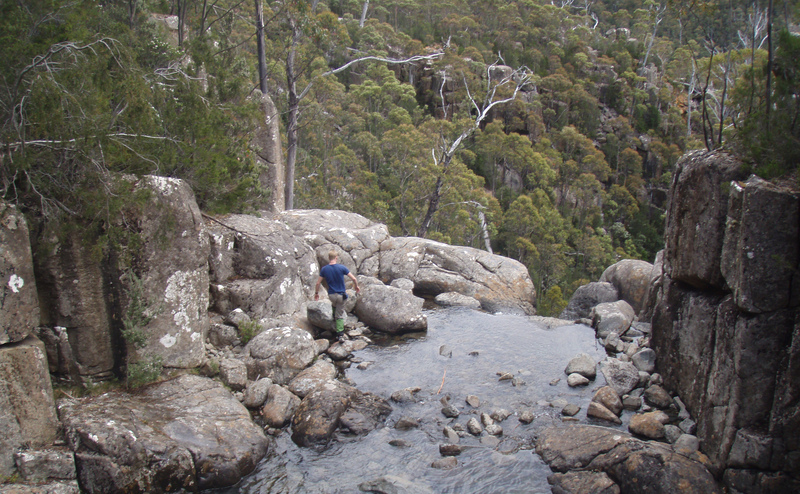 Once back on a more solid footing, the trail slowly climbs again to the top of Wellington Falls and its adjacent lookout. Return to The Springs following the same route.